GOG has gone through a dramatic change today. There are new appendages sticking out of its torso, which might be a bit shocking, but don’t worry, it’s not a freak mutation. Regional pricing, which was planned and subsequently scrapped earlier this year, has returned, but in an entirely optional format. 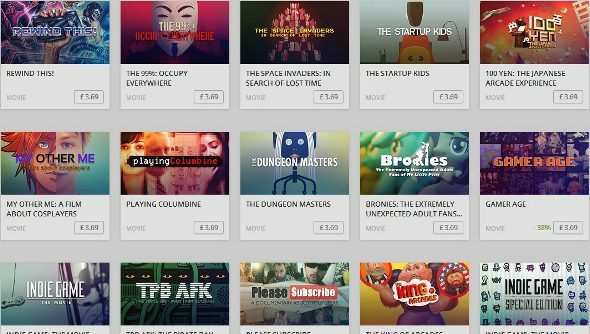 And the DRM-free platform is attempting to beat Steam to the punch when it comes to movies, offering 21 films – documentaries, all – about our funny old industry. Back in February, GOG announced regional pricing. It would mean that international customers would no longer need to purchase everything in dollars – which can be confusing when you only see the world in pounds. The upside was that more games would appear, ones from publishers that weren’t down with GOG’s Fair Price plan. Unfortunately, that would mean that, just as it is with Steam, customers in Europe, for example, would end up paying more than their US Dollar using counterparts. It didn’t go down well, and the plan was scrapped. Where some games don’t follow that method, because the publisher follows a different regional pricing scheme, you can stick with dollars, or you’ll be refunded the difference in price with store credit. Then there’s the DRM-free movies. Steam’s already dabbled in film, with both Indie Game The Movie and Free To Play, and the platform is expected to build on this. So GOG’s getting in there quick, offering 21 documentaries including Minecraft: The Story of Mojang (Deluxe Edition) and TBP AFK: The Pirate Bay Away From Keyboard, the latter of which is free. Most are $5.99/£3.69, though in a few cases this is a launch promotion. Just as it is with GOG’s game catalogue, each film will come with bonus goodies – “as many of them as we can muster,” says GOG. And more releases are expected each week.